Many hospitals using MEDITECH Health Care Information System can benefit from GRAND-PM-2-MEDICTECH add-on module designed to process work orders submitted from MEDITECH Stations. GRAND-PM MEDITECH Interface is desinged to facilitate work order the engineering/maitenance department in handling work requests submitted via MEDITECH stations. GRAND-PM add-on program converts work requests sent from MEDITECH stations to GRAND-PM work orders. The work order received from a MEDITECH station is then printed and stored in the GRAND-PM work order database. Therefore, you can easily track work requests sent by nurses using MEDITECH stations. This also saves time on your administrative staff having to type the work requests. No more paper requisitions to be completed and mailed. No more "pink" copies to be kept for reference. No more phone calls to find the status of the work request. No need to type description of the requested work. No more confusion in what needs to be done. Fewer interruptions with telephone calls. 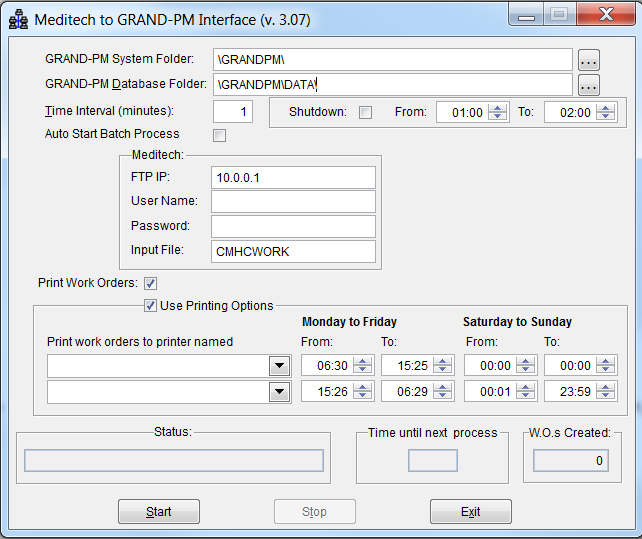 Click to view a sample screen of GRAND-PM MEDITECH Interface.